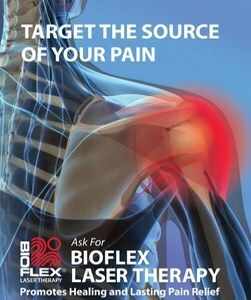 We now offer Laser Therapy at our wellness centre in Calgary SE. Laser therapy is a non-invasive, pain free therapy that is using the power of light emission to treat musculoskeletal injuries, chronic and degenerative conditions and to heal wounds. Laser therapy stimulates the cells that make up our tissues speeding up the cellular regeneration process and decreasing the amount of scar tissue produced. Laser Therapy treats the underlying condition or pathology to promote healing. This means that the treatments are effective and the benefits of Laser Therapy are long lasting. The light source is placed in contact with the skin allowing the photon energy to penetrate tissue, where it interacts with various intracellular biomolecules resulting in the restoration of normal cell function and enhancement of the body’s healing processes. Eliminate the need for drugs. Restoration of mobility (normal range of motion). Reduce the need for surgical intervention. Treatments are usually scheduled 2-3 times a week or more frequently in acute cases, at least initially. Subsequent treatments are scheduled in accordance with the patient’s status. With regard to the number of treatment sessions, these may vary from 1 to 30. A minimum of 10-15 treatments is recommended. It is important to be aware that before treatment is initiated that the exact number of treatments cannot be predicted. In most cases we expect to see some change in symptomology after 3-5 sessions. There are however exceptions to this rule. Acute injuries generally respond more rapidly than chronic problems and each individual’s tissue response varies. Please do not forget that our objective is to minimize the length of treatment and the number of visits. However, on occasion even our best efforts require multiple treatments, patience and time. The following services are provided by this office, but are not covered by AHCIP. Massage and Osteopathy may or may not be covered by your extended insurance plan. Laser therapy typically is not covered by extended health insurance. It may be covered by health spending accounts. It is the responsibility of the patient to pay this clinic for the treatment. The patient may then at their discretion submit the claim. Laser added to Massage or Osteopathy Packages. Laser added to Osteopathy or Massage will be in conjunction with the manual treatment. The above discount will be applied to 5 or 10 massage / osteopathy treatments over the prescribed protocol.